With Love From Rachel: are my lips on fire or is that just the duwop lip venom? are my lips on fire or is that just the duwop lip venom? 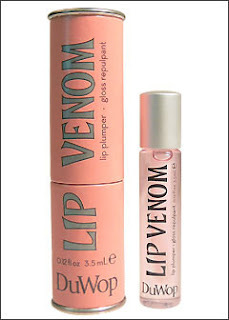 Lip Venom also contains jojoba and avocado oil which give your lips a lovely sheen. Honestly, I feel like this stuff works. My lips looked as though they had been stung by a bee. They also felt as though they had been stung by a bee, but only for about 5 minutes. I will be in pain for 5 minutes if for the next few hours my lips look plump and glossy. One thing to consider though is warning those who may come in contact with your lips. Mr. Doll still looks at me warily if my lips are even the tiniest bit shiny. He insists that his lips were numb for days...whatever. My lips looked good, and that was the whole point, right? This is a picture that I took 45 minutes after I had applied the product. I have no other makeup on, so as you can see Lip Venom also gives your lips a bit of a rosy glow. I would spend another $16 on this product. Ooooh! I love DuWop. Check out the Twilight Limited Ed. version, it has a raspberry colored stain in it. Luvs it! My hubby also refuses to surrender any sort of lip action in the presence of any sort of lip gloss- for he too can't stand the tingle! Big tough men, huh?